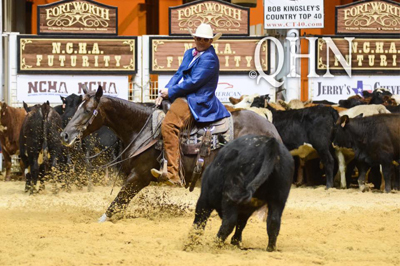 As the end of the National Cutting Horse Association (NCHA) Futurity draws near, the action is ramping up, and on Dec. 8, the Unlimited Amateur finalists got their time in the spotlight. Thirty-two talented duos competed for the coveted Champion’s check, but it was Wade Smith and Metallic Candlelit that walked away with the $12,656 payday. In the first go-round, the mare and Miller marked a 216.5, then they returned in the semifinals, where they marked a 214.5 to secure their spot in the finals. They were the seventh draw in the first set of cattle, and they laid down a solid run that the judges rewarded with a score of 221. After waiting through the rest of the first set and the entire second set, Miller, of Geary, Oklahoma, began to celebrate his victory. This win brings his Equi-Stat record to nearly $300,000. Metallic Candlelit is by Equi-Stat Elite $10 Million Sire Metallic Cat and is out of the Smart Little Lena mare Light My Candle, who won $11,885 in her cutting career. She has produced one other performer, Metallic Radiance, a full-brother to Metallic Candlelit, and he has earned more than $8,000 in the show pen so far. Eddie Patterson and Calculated Risk (CD Royal x Trouble Lynn 495 x Smart And Trouble) claimed the Reserve Championship with a score of 219. They took home a check for $11,398.